Atari Asteroids slot will surely invoke memories in those of you whom were around in the 80's and 90's when the Atari cabinet games became popular in Amusement Arcades and then some bars and clubs. They soon became available in home console form too and many a youngster spent hours trying to improve scores when they could plug it into the TV without disrupting their parents' viewing! 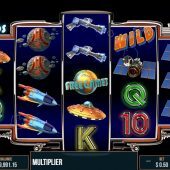 In this retro slot Pariplay have brought us transparent reels over a dark background featuring the old 2-D outline shapes of the Asteroids and Gun Pointers moving around and naturally some good 'zapping' noises as we spin. They also released another Atari-themed slot Black Widow to accompany Asteroids, but will our bankroll survive its perilous journey into space, or be blasted to bits? We don't get a conventional reel set here but a 3-4-5-4-3 pattern which as you know means a 720-way game. Like Microgaming's Pollen Party this pays both ways too, but here we get stacked icons and a bit more potential. We pay 50 coins per spins and Asteroids are the top pay at 12x bet for a 5-of-a-kind win. Rockets pay 6x, Ray Guns 5x, Flying Saucers 4x and Satellites 2x plus there are card values paying 1 or 1.5 for a full way. There are Wilds that appear singly on reels 2 and 4 and these will stick if involved in a win and keep doing so until you get another losing spin. If they land right at the bottom of the rows on reels 2 and/or 4 they expand, but don't stick afterwards. To get the bonus we need 3 or more Planet Scatters anywhere in view. You get varying numbers of spins and multipliers depending on how many scatters trigger the games. The basic 3 awards 10 spins with a 2x multiplier, 4 gets you 20 at 5x and all 5 an interplanetary 30 with a 10x multiplier. The games are played on different reels with a dark background and a selection of the various white-outline old Atari spacecraft and game icons, which certainly brought me back some memories. You can retrigger them as above, each set of spins played after the the other if the scatters are lower or higher than the original triggering number.